The world’s first fully shoppable music video? I’m not convinced it’s the first, but it’s certainly interesting. An expandable ‘S’ icon hovers over each of the artists from shot to shot, and clicking on it pauses the track to bring up the window below. Shame the song’s so rubbish (Diplo, what are you *doing*?!) Thanks to Matt Muir for the tip off. L.O.V.E. 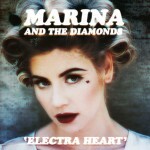 First look at her Electra Heart album cover too.